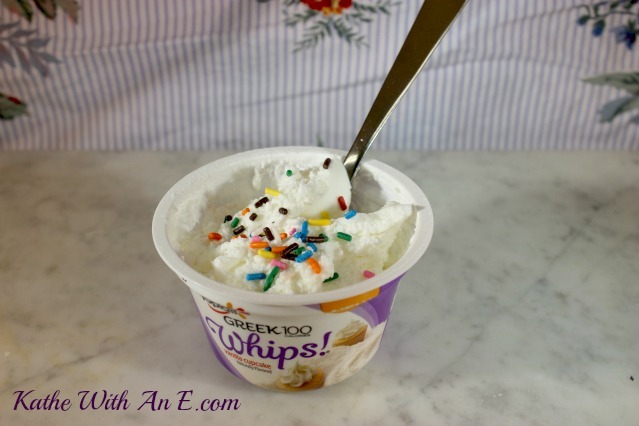 ic Kathe With an E: Whip Up A Party In Your Mouth With Yoplait Greek 100 Whips! Whip Up A Party In Your Mouth With Yoplait Greek 100 Whips! This article is sponsored by Yoplait Greek 100 Whips! You may remember a few weeks ago I reminded you that breakfast is the most important meal of the day. I have been doing really well in having a good breakfast each morning. Now, I'm here to tell you about that other important part of a day, SNACKING! Yes, snacking can be important too. Especially if you keep it healthy. Done right, it can actually be a party in your mouth. 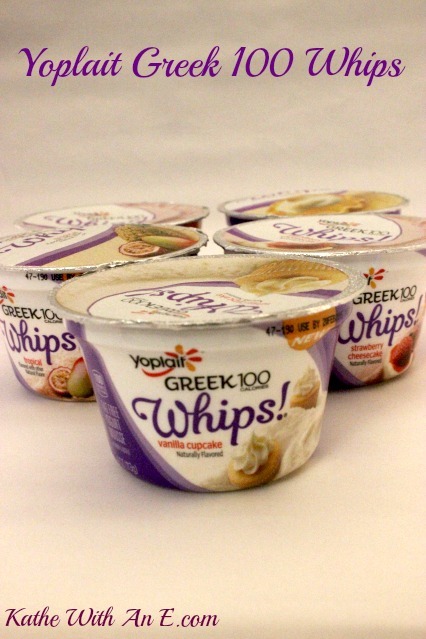 Because I really love Yoplait yogurts, I was really excited to learn about their new product, Greek 100 Whips!. They are super light and fluffy, like a mousse actually, are only 100 calories with zero fat and they come in 8 fantastic flavors like Vanilla Cupcake, Black Cherry and Lemon Meringue. Plus, you can use them in recipes too! In fact, here are a bunch of tasty recipes for you to take a look at. BAM! Snack party time with no guilt! That's right, a party can be as simple as adding some fun sprinkles! Whip it up! Whip it real good! You can even dance around while you eat it. I won't say nothing! Pinky swear! I know you are going to want to try some of the Yoplait Greek Whips! for yourself, so, here's the Yoplait Greek 100 Whips! coupon page so you can save a buck when you go to buy your own. Isn't it time for you to make your snack time, party time?? I could think of a dozen fun ways to use this for snack time! I can't wait to give it a try! These are so yummy! My favorite is strawberry with graham crackers. I've tried them, too. They're great! I just tried these for the first time, the strawberry cheesecake is so good! I love the light texture of them. Can't wait to try more! Thanks for the coupon! Love Yoplait!